Find hotel near Taling Chan Floating Mark ..
Taling Chan Floating Market is located just a few kilometres outside Bangkok and offers its visitors to enjoy a meal along with some shopping activities right in the middle of a river. You can also ride a long tail-boat along the klongs (canals) here for as low as THB 100. You can also enjoy a relaxing foot massage here for THB 200. 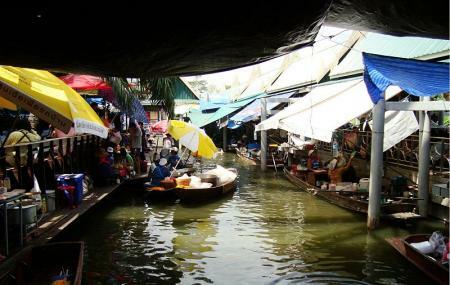 Visiting this floating market will bring you closer to the local culture. These markets are over-crowded but worth visiting. You can also choose to walk along the river banks to get a local feel. At the entrance of this market, you will see plant and gardening stores followed by shops selling fresh local produce like fruits and vegetables. You will then pass many small wooden bridges where you can enjoy some local sea-food. Do not forget to indulge in some shopping. Generally, tourists prefer visiting top attractions of Bangkok like Wat Pho Reclining Buddha, B T S Skytrain, Rajawongse Clothier, Grand Palace and Wat Phra Kaew. These are few of the top things to do in Bangkok. For other interesting insights of the city, you can explore Bangkok tours. Hotels like Ibis Bangkok Riverside, Kokotel Bangkok Surawong, Holiday Inn Express Bangkok Sathorn and Marvin Suites will solve your problem of where to stay in Bangkok. There are plenty of ready-to-book Bangkok vacation packages available that will cover the major attractions, accommodation concerns including the prime one like how to reach Bangkok. How popular is Taling Chan Floating Market? People normally club together Dusit Zoo and Toy Kuay Teow Reua Boat Noodles while planning their visit to Taling Chan Floating Market.